We get it—you love your BBQ Grill Box stove accessory. You use it all the time for brats, burgers, veggies, steaks, chicken, and more. The cast iron grill grates give you great sear marks, and the heat diffuser plates cook food evenly. What’s not to love? However, all this can turn into a smoking hot mess if you don’t take the proper steps to clean and maintain your grill box. Follow our guide below to help keep your BBQ box in good shape and your backyard barbecues going all year long. Check out our tips now. You should clean out your BBQ Grill Box a couple of times a year, or whenever you notice a great deal of smoke during your cooking. If you see this, it usually means there is a build-up of grease in the bottom of the box that you need to clean off. To do so, follow these steps: 1. Remove the cast iron grates. 2. Wipe out the bottom of the box with a paper towel to remove as much food, grease, and ash as possible. 3. Clean with warm water and mild dish soap. 4. Rinse thoroughly with a garden hose. 5. Dry completely to prevent rust. You can heat the box on the stove at low heat to evaporate all moisture. 6. Apply a few drops of oil on the hinges of the lid (if yours has a latching lid). You can’t fully prevent the fasteners on your BBQ box from rusting over time, but a little oil can delay that process for years. The easiest way to keep your grates clean is to brush or scrape them before each cookout. Many people make the mistake of cleaning this part of your grill once you are done eating. Leaving the grime on the grates is actually a great way to prevent rust. If you scrape the grates when you finish cooking, you just leave them exposed to the elements until your next cook. Instead, scrape the grates after warming up the grill before each cook. Use a grill brush with wire bristles, or try a stainless steel grill spatula. 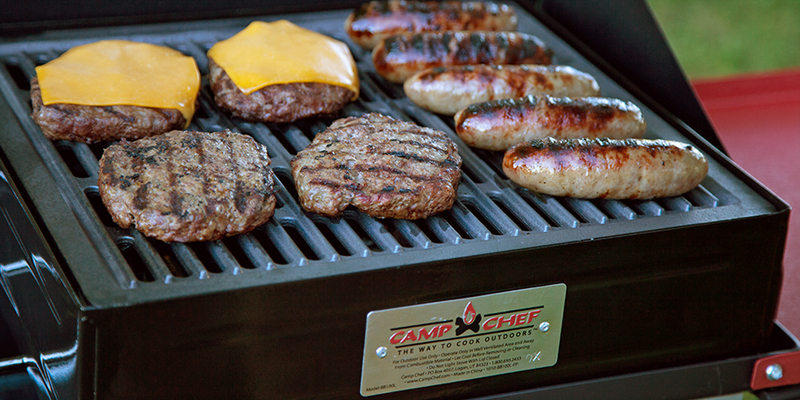 The grooved front edge fits in between the grates of your grill for better cleaning. Because the grates on your BBQ Grill Box are cast iron, you don’t want to expose them to moisture for a long period of time. That being said, soaking them for a little while can help loosen up some of the stubborn bits of food that have burnt onto the metal over time. Fill your sink (if it’s large enough) or a bucket full of warm water and a few tablespoons of our Cast Iron Cleaner. You should avoid other cleaning solutions like baking soda or vinegar unless you are planning to strip the cast iron seasoning away and start a new patina. Leave the grates soaking for about an hour. Remove the cast iron from the water and scrape it down with a chain mail scrubber, grooved spatula, pan scraper, or BBQ brush. Afterward, rinse thoroughly, dry completely, and apply Cast Iron Conditioner. You should season your cast iron grates every few cookouts and after any deep cleaning. This will help keep your food from sticking and prevent rust from corroding the metal. To do this, follow the steps below: 1. Warm up the cast iron grates in BBQ Grill Box or in your oven. They should be warm, but not too hot to touch. 2. Apply a generous coat of Cast Iron Conditioner or high grade cooking oil (olive or coconut oil). 3. Rub the conditioner or oil into every surface of the grates. 4. Wipe off excess conditioner or oil. You want the cast iron to be coated but not wet. 5. Return grates to the grill box or oven, turn off the heat, and let cool. Most often, what leads to a smoky BBQ box is cooking especially greasy foods. Ground beef with a higher fat content, oily marinade sauce, and others may produce extra smoke while you’re cooking. You may want to clean your grill box out after grilling foods like that. Because of the high BTU output on most of our stoves (30,000 BTU—that’s no joke), you don’t need to use higher than medium heat setting on your stove when using a BBQ Grill Box accessory. Trust us, medium will be plenty hot to get those masterful sear marks on your burgers and veggies. Keeping it at this temperature will help maintain the base of your grill box and prevent warping. Have other questions? Let us know in the comments below, and we’ll do our best to answer them! Yeah, apparently turning the burners up to high to clean the grill is a bad idea. My grill box is warped and now if I try to brush the grates they fall down into the box. I do similar things when cleaning mine. I do wish the inner angled plate under the grill was also removeable to make cleaning easier, especially after using some smoker pellets. Awesome article! Keep sharing with us. Cleaning the inside grill grate and the ash out is very important to keep it looking nice and testy food.